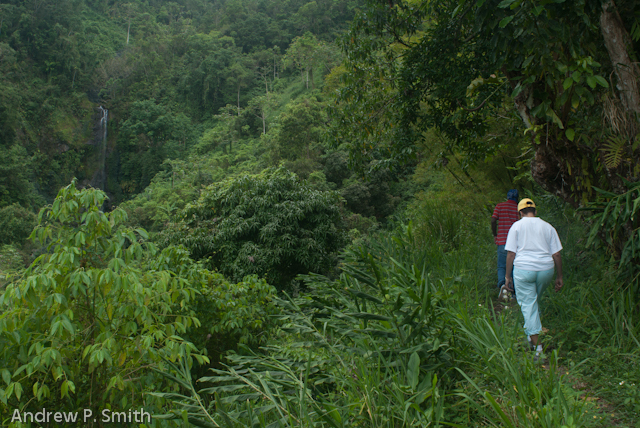 I’ve always wanted to become more familiar with some of the many hiking trails that surround my community of Cascade in the Blue Mountains of eastern Jamaica. I had the opportunity to do so when my cousin visited from Canada. When I told her that we would be able to hike to Holywell Park, I don’t think she knew exactly what she was getting herself into. Holywell Receational Park is located at Hardwar Gap on the St. Andrew/Portland border at 1,800 metres above sea level. 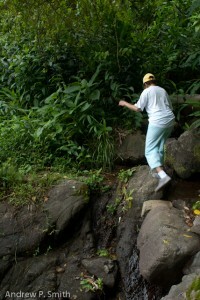 It is a popular hiking and camping site where many Kingstonians get their first taste of “bush”. It is also a world-famous birding location where many of Jamaica’s endemic avifauna can be observed in the montane mist forest in this section of the Blue & John Crow Mountains National Park. Most people get there by driving the fifteen miles from Kingston, which takes an hour to drive, thanks to the condition of the roads. We however, were on the Portland side of the mountains and my dear cousin had the misfortune to find me in a mood for discovery. Negotiating one of the watercourses. 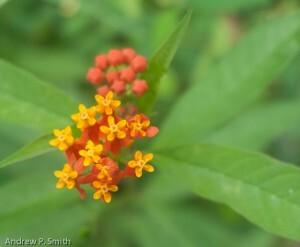 One of many flowers found on the trail. Following our able guide, Artie “Trelawny” Vernon, we started at Regale, close to the One Drop Waterfall which is one of the highest waterfalls in Jamaica. The first stretch is quite steep, especially for one used to the plains of central Canada. I could claim that I was quite fit and used to such terrain and that the only reason I was at the back was to take photos and oversee my cousin. This wasn’t entirely true, since I’m sure my gasping for breath drowned out the birds in the forest canopy. We soon warmed up to the challenge and after an hour, the trail levelled off and we were able to enjoy the scenery and the wild raspberries found in the nearby thickets. The main landmark is the Old Tavern, a 19th century building that dates back to when soldiers and other travellers made their way from Kingston to the north coast for trade and protection. Now part of a coffee plantation, the building is still in very good condition. After 1 hour and 53 minutes (yes, I timed it) we finally reached Holywell. What I’ve always said about hiking is that the further you hike in one direction, is the further you have to go back. Fortunately this wasn’t quite the case for us since we took another route back which included the main road and the Green Hill Trail. The latter is very steep, but reduced the time substantially. We made it back in under 90 minutes, and we would have been back sooner if I wasn’t bring up the rear – photographing. In spite of the unexpected challenge, I am happy to say that my cousin enjoyed her day and that we were both able to walk quite normally the following day. March 2013 will be a red-letter month for the citizens of Cascade in the Blue Mountains of Portland, Jamaica. This is the month when a section of their main road which was destroyed by a landslide in December 2004 was finally repaired. Repaired just in time for students of the Cascade Primary School to have their sports day on the newly surfaced road. 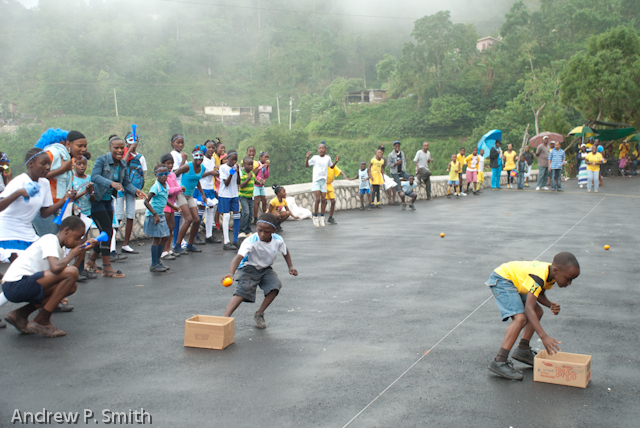 Students compete in the potato race during sports day of the Cascade Primary School in the Blue Mountains of Portland, Jamaica on March 27 2013. Cascade is 1,000 metres above sea level in Jamaica’s Blue Mountains, an area known globally as the source of one of the world’s most expensive coffees. It is also part of the Blue & John Crow Mountains National Park, which has been submitted to UNESCO to be considered a World Heritage Site due to its unique natural and cultural heritage. Taking these facts into account, one would think that Cascade’s residents are benefiting from such natural wealth. Unfortunately this is not the case. The community’s economy is based on the coffee industry, yet the subsistence farmers and pickers do not benefit from the price that global consumers pay for the brew. In addition, since 2004 several landslides have resulted in the main road being cut-off in several places. These factors resulted in out-migration from Cascade, resulting in a current population of less than 600 residents. 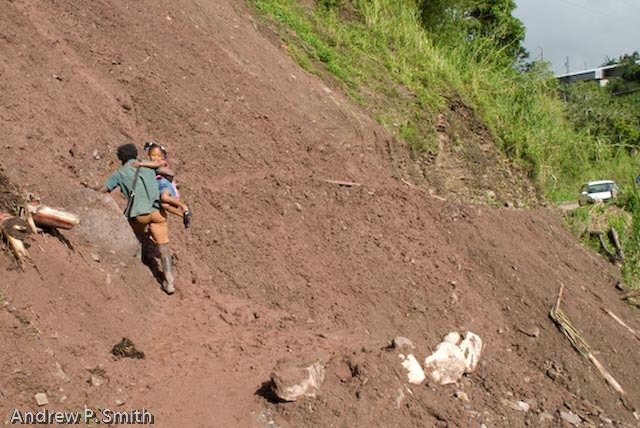 A resident of Cascade carries a child over the landslide at the Cascade Primary School on November 28 2008. 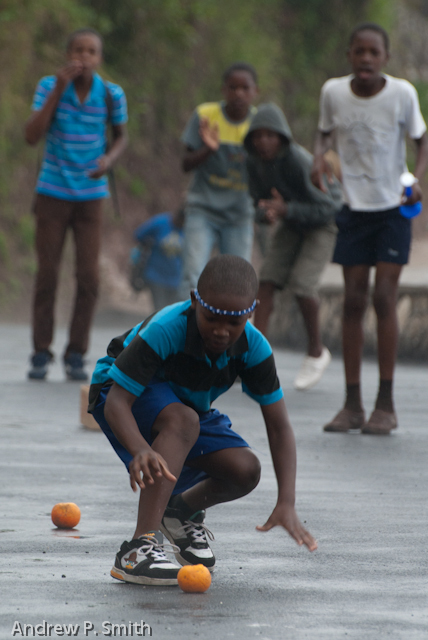 A student participates in a potato race while urged on by his team-mates during the sports day of Cascade Primary School. 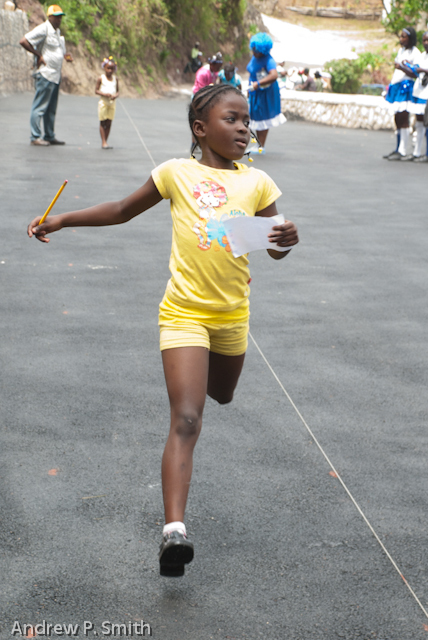 A student of the Cascade Primary School participates in the Maths race during sports day in the Blue Mountains of Portland, Jamaica. In spite of persistent rain and clouds the 56 students and their teachers came out to continue Jamaica’s fine tradition of athletic competition, which includes such world-beaters as Herb McKenley, George Rhoden, Donald Quarrie, Merlene Ottey, Grace Jackson, Veronica Campbell, Shelly-Ann Fraser, Asafa Powell, Yohan Blake and Usain Bolt. Here’s hoping that some of the participants in the Cascade Primary School’s sports day will be able to overcome the challenges of life in Cascade and continue this tradition.